New Beginnings will be funded by the Reaching Communities Big Lottery Fund from January 2018 and will be running for another three years. The aim of the New Beginnings Project is to work with the refugee & asylum community in Blackburn with Darwen to enable them to help each other to settle into life in the UK. New Beginnings will be running for three years. The aim of the New Beginnings Project is to work with the refugee & asylum community in Blackburn with Darwen to enable them to help each other to settle into life in the UK. 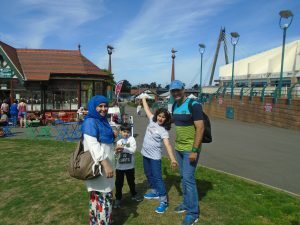 The members of New Beginnings are becoming active citizens who can assist other new people to settle into life in the UK, to engage with the indigenous population as well as immigrants from other parts of Europe. The project is aiming to build the groups skills and confidence, reduce the isolation that so many refugees and asylum seekers can experience, reduce the risk of members being influenced by extremist voices, and will contribute to enhanced community cohesion. The project intends to develop and recruit 36 local Community Champions.